Mysuru: Renowned cardiologist Dr. S.P. Yoganna has said that Private Medical sector has earned public faith and has grown by leaps and bounds across the country. He was speaking at the Doctor’s Day celebration organised by the Mysuru chapter of Indian Medical Association (IMA) at Jayachamaraja Wadiyar Golf Club (JWGC) here yesterday. Pointing out that Government Doctors contribute only 15 percent of the Medical fraternity, Dr. Yoganna said that there were over one lakh Private doctors in the State offering Medical services, while there were only 4,000 Government doctors. Noting that the country’s renowned doctor B.C. Roy was among the medical fraternity who fought for Independence, Dr. Yoganna observed that the Government of India bestowed ‘Bharat Ratna’ award on him, considering his yeoman service to the medical sector and the society. Dr. M.B. Bharathi, Dr. B.R. 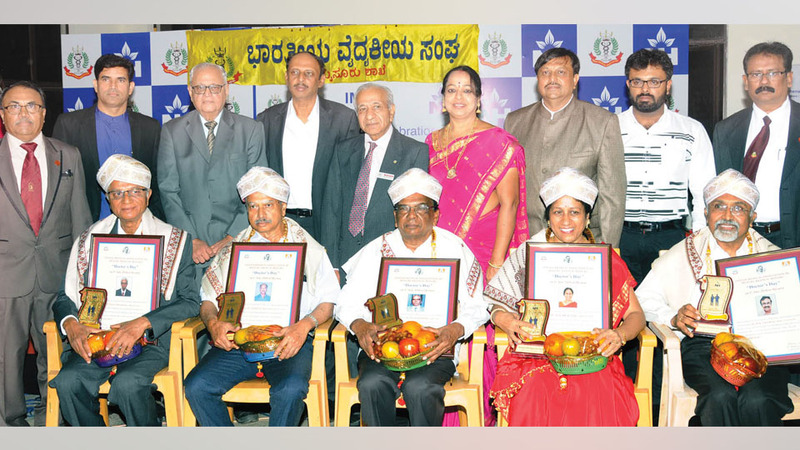 Nataraj, Dr. S. Ranganathaiah, Dr. Xavier D’Souza and Dr. P. Sathya were felicitated on the occasion. Former IMA National Vice-President Dr. B.V. Rajgopal, Chitra’s Hospital Director Dr. R. Mahesh Kumar, IMA Mysuru Chapter President Dr. M.S. Vishweshwara, Hon. Secretary Dr. Sujatha S. Rao, Narayana Hospital Medical Superintendent Dr. Dilip and others were present.